In March 2018, the Maple Ridge – Pitt Meadows School District implemented a new program that simplifies waste collection, diverts more of our waste from the landfill, and reduces the environmental footprint of our schools. The program was developed through a consultation process that included input from teachers, custodians, other district staff, union representatives, the district’s Environmental Sustainability Committee, the City of Maple Ridge, as well as local waste vendors and local recycling groups. The new program aligns with board policy 6530 Environmental Sustainability and supports the district’s objective to act as a responsible steward within our community, cultivate a culture of care, and seek to develop the leadership and citizenship capacity of all learners. Under the new Waste Collection program, waste is separated into three streams – organics, recycling, and garbage. This separation process is the responsibility of every user of school district facilities, including students, teachers, management, staff, parents, building visitors and facility renters. The school district will monitor and review the program on an ongoing basis to determine where additional improvements can be made. Under the new Waste Collection program, waste is separated into three streams – organics, recycling, and garbage. All food scraps and soiled/wet paper are accepted (including paper towel and tissues). No cups, packaging or plastic are allowed. Organics are collected in green bins with lids that latch. The bins are lined with compostable bags. Custodians remove the liners every day directly to a lockable, bear-proof outdoor bin. All paper, cardboard, plastic, containers, lids, metal, unbroken glass, tetra packs, juice boxes, cans and bottles are accepted. 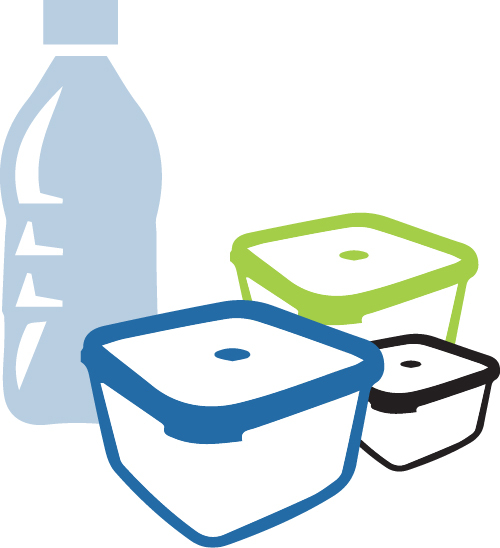 Recycling is collected in blue bins without lids. The bins are lined with recycled, light-grey bags and custodians remove the liners two times a week directly to a lockable, bear-proof outdoor bin. Refundables are collected in the recycling bins. However, if a school or classroom wants to separate refundables and return them for a refund, they are responsible for the separation of the items, and for emptying and cleaning the refundables bins. Any items that are neither organic nor recyclable are considered garbage. Garbage is collected in small bins previously provided. The bin is kept under the desk or out of sight in order to encourage proper sorting. The bins are lined with black liners. Custodians remove the liners two times a week directly to a lockable, bear-proof outdoor bin. Want to help? Pack sandwiches, fresh fruit, fresh veggies and treats in resuable containers instead of disposable plastic bags. Similarly, where possible, provide your child with reusable drink containers instead of disposable juice boxes and plastic water bottles. Where do food/candy wrappers go? Blue recycling bin. When in doubt, recycle it! Where do paper towels go? Blue recycling bin OR the organics bin. They are accepted in either. Where do personal hygiene products go? All staff washrooms and girls’ washrooms should have a small garbage can for personal hygiene products. Put in a request with manger of custodial/community rentals if they are missing. Where do diabetic testing strips, bloody tissues, sanitary wipes for changing tables, latex gloves go? Where does wax paper go? Where do used tissues go? Where do coffee pods go? The plastic gets recycled, the grounds go in organics. Where do pencil shavings go? Where does broken glass go? It should be double wrapped in a garbage bag and put in the garbage. Where do we put cardboard? Break down the cardboard and put it into the large black transport cart at your school. Please do not stack/pile the cardboard near the blue recycling bins. Take it to the transport cart. Where do arts/crafts go (paper with glue/glitter), foam, pipe cleaners, etc.? Arts and crafts that are not paper or plastic can go in the garbage. If it’s paper/plastic with a small amount of glue or glitter, then it can be put in the recycling bin. Can we put our bins outside of the back door of the classroom? No, outside there is potential to forget the bins, the bins will get dirtier outside especially when it rains, there’s the potential for theft, attraction of ants/pests, and loss of control of what may be added to the bin. Can we bring bins outside for recess/lunch? Yes, one set of bins can go outside for recess, but they have to be brought back inside at the end of recess. The principal designates the person responsible for moving and supervising the bins. Can we put our bins outside our classroom door in the hallway? Under special circumstances (if the classroom is too small), with permission from your principal. We don’t want to overload the hallways, as this would be a safety hazard. Can our staff get a presentation on the new waste collection program? Yes, request a meeting with Nora Wintermute, manager, energy & environmental sustainability. Can we still collect and return refundables? Refundables are collected in the recycling bins. However, if a school or classroom wants to separate refundables and return them for a refund, they are responsible for the separation of the items, and for emptying and cleaning the refundables bins. Contact the manager of custodial/community rentals to obtain a refundables bin. Our Green Group would like to collect items that aren’t eligible for recycling (e.g. pens, markers, electronics and batteries) can we do that? Yes, but the bins will be a school responsibility. Contact the manager, energy & environmental sustainability for bins and facilities that will accept these items. What days do the bins get emptied? Exterior Bins: collected on weekends. Do containers and packages need to be rinsed before going in the bins? The recycling is washed at the sorting facility, so dirty recycling is allowed. But we highly recommend that the recycling is rinsed, since the bin is only changed two times a week. If we put the wrong thing in the recycling, does the whole bag end up in the landfill? The licensed plant sorts through the recycling at their facility and they decide what items get sent on for further processing. A few wrong items in the recycling will not mean that the whole bag gets sent to the landfill. If we put the wrong thing in the organics, do we get fined? For the next few months, as students and staff get used to the new program, we will not be issued fines. However, once the program is fully implemented, non-compliant loads will be subject to fines. Where do the organics end up? Super Save Disposal sends our organic matter to Harvest Power and/or the City of Surrey Biodiesel. What do we do if we have a high volume of heavy recyclables? Try to divide the items between a few blue bins. During classroom/locker cleanouts we will provide extra bins to accommodate the large volume.